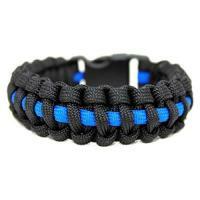 Support our brothers in blue with this 550 paracord bracelet from Echo Tactical! Now you can carry several feet of 550 paracord with you wherever you go at all times. With a rating of 550 pounds, the E1-PCB550 bracelet consist of paracord that can be used for emergency or survival applications. The Echo Tactical bracelet can be unraveled when one needs for rope for whatever purpose. The type III paracord contains 7 inner yarns which allow for many uses where additional small cordage is needed. There are many uses for paracords including building shelters, securing items together, fishing line, and many more tasks. This bracelet offers strong ABS side-release buckles and fits wrists up to 7" to 9" in circumference. Thin Blue Line style bracelet - support the law enforcement community! This is made very well. I support our LEOs, will wear it at the NRA National Meeting in Dallas next month. Hopefully I will not be forced to fight my way through. To big but looks to be constructed well. Very good reminder of those who serve. Back the thin blue line. Fits my large sized wrist very well. Great craftsmanship. Awesome to support the thin blue line. Really nice item, other officerd are asking me about it. While I am not in law enforcement myself, I appreciate CopsPlus support for the people who have to put up with the rest of us. Thin Blue Line, enough said. A good item to have when you're in a pinch. A must have. Very nice survival tool-confortable-easy to deploy. Support the blue. Fits perfect. I wear it everyday great product. It's always a good idea to have certain items in your EDC, and this is one of them. If you'd rather have a completely black bracelet you can use needle nose pliers (or your teeth) to pull out the strip of blue cord. Thanks for backing the blue.